As a girl, I spent summers in the Mellon Gallery looking at the old, forgotten world of the Dutch Masters. I carry the memory of their use of light, especially candle light, with me. Later in my travels I would find that same light again. Photographing the Tarahumara people of Northwestern Mexico since 1998, I was drawn to their traditional way of life. As in ancient times, their customs are passed down through oral tradition in their own language, Rarámuri. Living in remote areas of the Sierras, the Tarahumara have kept their sense of community through a rich and colorful ritual life. These rituals mark and celebrate the passing of the seasons so important to agrarian lives. 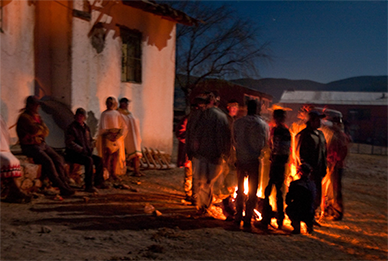 Fire Light was begun in 2007 during a Tutu Buri / Yúmari celebration on a moonless, spring night. It was pitch-black except for the scattered warming fires at the edge of the dance circle. I was disappointed with the lack of light but did not want to use a flash. A fire was built for me just behind the Chapeyokos so that I could photograph their use of the mask. I liked the tone captured by the camera with the firelight located so close to the Chapeyoko figures – mysterious, larger-than-life images of masked beings, This series had the look and feel I had experienced so many times before. The vexing question had always been, how to move the fire around with me? My guide Santiago and I discussed this at length when it suddenly dawned on us to use the lanterns from the ball race to light the ritual dance. They gave me the mobility I needed to capture this ecstatic scene. Two years later I was again in the highlands for a Mate Chine dance and Tutu Buri / Yúmari. The people camped overnight in the village, dancing, cooking, and drinking, throughout the night of December 11th. The dancing continued until the morning of the 12th, then food was passed out to feed the community. A few days later another Tutu Buri / Yúmari took place to honor a Tarahumara woman who had passed away. These rituals enabled me to complete the Fire Light series, not only shooting stills but video as well. I captured much of the action by firelight and many images were made possible by the use of our specially modified ball lanterns, Best of all, the Tarahumara grew accustomed to my presence, and the lanterns. Laughing when we lit them and asking if we were going to run a race. The Fire Light series moved beyond documentation. Working in the back country for over ten years,I have been to many such gatherings and felt comfortable around the laughter, drinking and carousing that goes on during breaks in the dancing. The series has the look and feel of the night ritual acts, campfires, and celebration. In addition to recording the dance I wanted to show the women’s involvement – the strong sense of community and tradition. What began as an interest in Native American culture, continued out of my growing respect for a people, who in the face of overwhelming odds, continue to live their lives outside the mainstream comforts of the modern world. These people retain the skills and knowledge to survive in harsh conditions, a skill lost by most of us.